This opinion piece was published on Berlin Policy Journal and versions of it are published in Le Monde, La Repubblica, Handelsblatt (pdf), El Pais, Hospodarske Noviny and Capital.bg. Big is beautiful – so the claim of many European business leaders and Peter Altmaier, the German economics minister, when they talk about Europe’s corporate position in the world. It is true that EU companies remain highly competitive globally and very successful exporters. It is also true that the EU continues to be a very open economy with a trade surplus. Yet, despite this, there is a fear that EU companies will find it increasingly difficult to be on top of the global value chains – or put differently, to be global leaders. And despite the successes of EU companies, among the top 50 Fortune 500 global companies there are only 10 firms from the EU, while there are 21 firms for the US and 11 from China. The picture among the top 100 Fortune500 global companies is even more gloomy (37 firms from the US, 23 firms from China and 22 firms from the EU). Moreover, in the world’s top 20 technology firms, sectors that are central to the success of whole economies, there are no companies from the EU while there are 11 firms for the US and 9 from China. Europe clearly lags behind its global competitors both in the platform business (Evans and Gawer, 2016) and forecasts are no better while 70% of the global economic impact of AI is expected to be concentrated in North America and China. Many argue that EU-based firms simply lack the critical scale to compete. A recurring argument made to address this problem is that Europe’s competition policy should change. Merger control should become less strict so the argument of a recent BDI study on China. Moreover, merger control should become more “dynamic”, ie take account of possible future competition effects or “flexible” to address concerns beyond potential anti-competitive effects, such as environmental, social or other concerns. 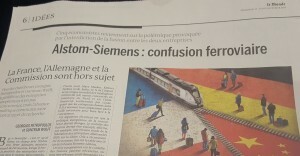 Most recently, this was discussed in the case of the Siemens-Alstom merger case. Europe’s merger control laws may or may not need reform. But asking the Commission to so suddenly abandon its approach and to go against the letter of the Merger Control Regulation is certainly wrong. Moreover, careful thinking is needed as to avoid undesired effects of political intervention in specific cases. European consumers still benefit from relatively low mark-ups thanks to high competition which could be easily undermined by relaxing merger control. And one should also not be naïve about the benefits that larger companies would enjoy when entering a market like the Chinese one, where access is highly regulated and limited. In our view, the following avenues are more promising for European companies as well as European consumers. First, applying a form of state aid control to foreign companies needs to be made more effective, both in our markets as well as extraterritorially. EU competition law should be applied in a non-discriminatory way, regardless of the origin of the firm; the criteria for pursuing cases should be where markets are distorted. The Commission could become more confident in its enforcement, but to do so the EU’s legal framework will have to evolve significantly, a point also recently made by BDI. The EU cannot apply state aids rules to foreign governments and there is currently no systematic, effective or well-founded way for the application of EU state rules in the case of firms that operate in EU markets but receive state support in other jurisdictions. Yet it is possible to imagine an instrument that could be applied to foreign firms that benefit from state support in a way that creates unfair competitive advantage that European companies cannot match. EU law should seek to ensure a level playing field for all companies. To this effect, the WTO agreement on subsidies and countervailing measures can provide a platform for an international collaboration that can help the EU to react in the case of subsidies that distort international trade. However, it suffers from three main problems: The notification of subsidies is not fully transparent and its efficacy is limited. Second, remedial action is slow and complex. Third, EU state aid rules apply to both goods and services while the WTO rules apply only to goods. In our economies that are increasingly driven by services, by networks and data, focusing only on subsidies in the goods sector is insufficient. Regulation can be used to restrict the entry of foreign corporations that receive distortionary state support. But a transparent process is needed that avoids that the instruments are misused. The benefit of such a system is that it can effectively limit security concerns and its existence, as such, can discourage unwarranted behavior. 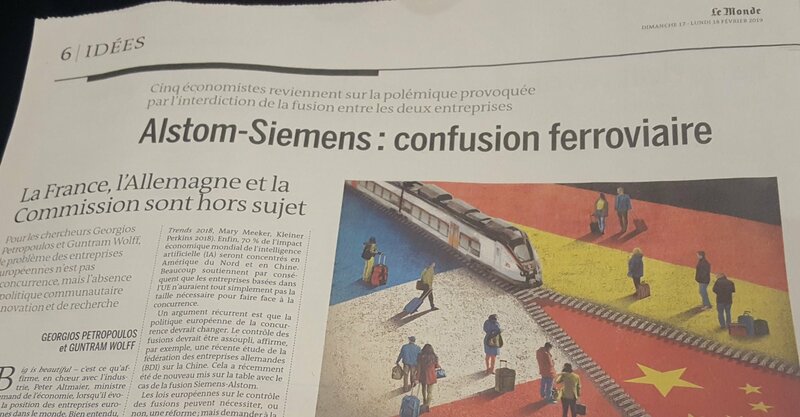 Yet, it is and must be clearly constrained to well-defined concerns, with objective criteria, to avoid that it become just simple tool for protectionism. It is thus not suited as a general state aid control mechanism. Second, Europe should go beyond defensive measures and more actively pursue a strategy that bolsters investment and innovation in Europe, while creating the conditions for firms to scale up in a well-integrated single market. A multidimensional mix should consist of policies to strengthen and deepen the single market, which is still fragmented in services. Sufficient market financing should also be ensured for firms to be able to expand their operations and compete efficiently in a global scale – for which integrated and deep capital markets, including for venture capital, are needed. There is a need to improve risk-taking and also improve business and investment conditions in a number of countries. The EU’s R&D spending is still at only 2% while the US is at 2.8% overall. Moreover, North America and Asia are the frontrunners in private investments on AI. This dark picture is a direct result of a lack of an effective European investment let alone industrial policy strategy. The EU’s global competitors adopted much earlier ambitious AI strategic plans where industrial policies and public/private investments have prominent role. After Brexit, the EU’s picture on AI will look much worse as London remains in the lead for AI companies, making a European strategy all the more important. Europe also needs a clear industrial policy strategy to achieve a degree of technological independence in critical digital infrastructure. In a world where not only individuals but also more and more industrial processes are fully interconnected, certain key technologies need to be produced and understood in Europe to ensure economic security. This requires strong European technology companies. Finally, it should not come as a surprising that Europe is losing the technology race given that its universities are lagging behind the top performers. For example, in mechanical engineering, the best German university, Aachen, ranks only in the group of 51–75-best, well behind 12 Chinese universities according to the Shanghai ranking. Outside the UK, only Milan and Leuven rank ahead of Aachen among EU based universities. Do Germany, France or the EU have a strategy to address this problem? To conclude, global competition is indeed becoming tougher, in particular with China increasingly leading in key technology sectors. Europe needs to face that competition. Defensive instruments to address state subsidy concerns are part of the solution ; relaxing merger control is probably not the answer. But the real question is whether the EU will strengthen its single market, increase R&D spending, regain its leadership of universities and design a true and integrated AI strategy. Big may be beautiful but the strategic priority for the EU should be to become a frontrunner in innovation and the adoption of new technologies. For that, it needs investment, research and education.